As Zimbabwe regains its foothold as a legendary destination of cultural and natural treasures, Great Plains Conservation has been building new safari experiences to bring visitors back to one of the most exciting and authentic safari destinations in Africa. 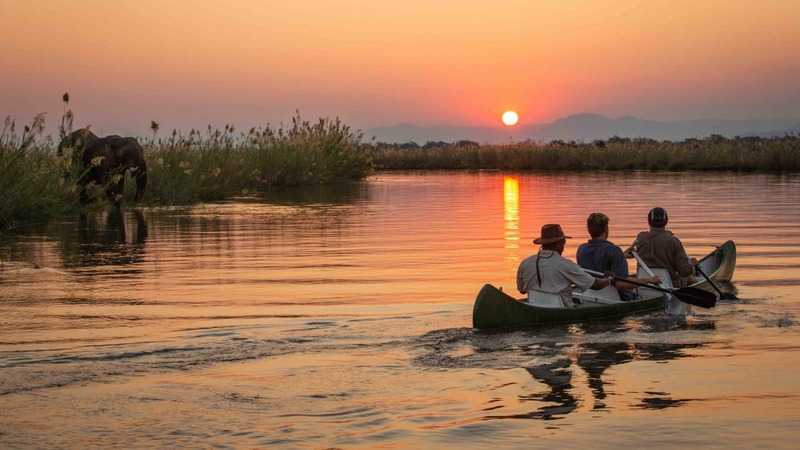 Great Plains Conservation has contributed to Zimbabwe’s come-back with 4 new camps in two parts of the country: Mpala Jena, Mpala Jena Suite, Sapi Explorers Camp and Sapi Springs Camp. Luxury-in-the-wild experiences that cater to travelers who want safety and comfort as they wander the breadth of the earth’s most pristine places. Find Zambezi National Park on the southern bank of the Zambezi River some three miles on paved road from Victoria Falls Town. Victoria Falls Airport (VFA) services flights from Robert Gabriel Mugabe International Airport (HRE) in Harare, the international gateway to Zimbabwe. Mpala Jena and Mpala Jena Suite are located around 10 miles from the park entrance. 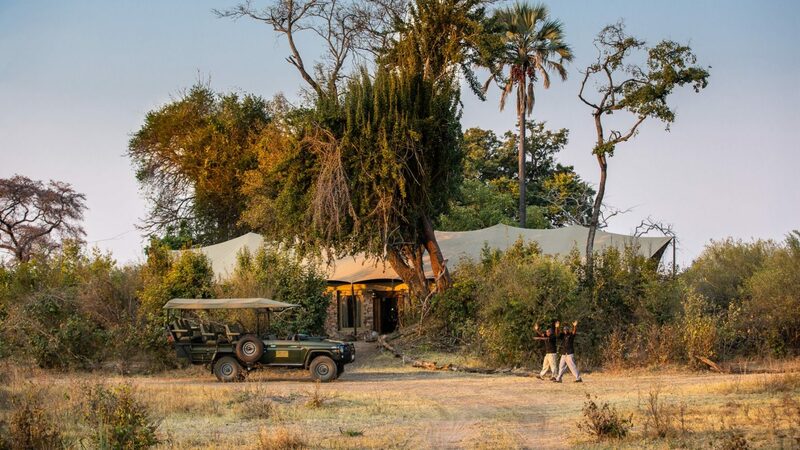 Complimentary return road, or road and boat, transfers from Victoria Falls International Airport are included in the nightly rate for these camps. Transfers can be turned into added adventure by requesting a road transfer conducted as a safari drive through the Zambezi National Park (around 1 hour and 20 minutes); a road and boat transfer (1 hour to 1 hour and 25 mins); or a road transfer from Victoria Falls Airport to town followed by a helicopter flight to camp (30 mins) for an additional cost. 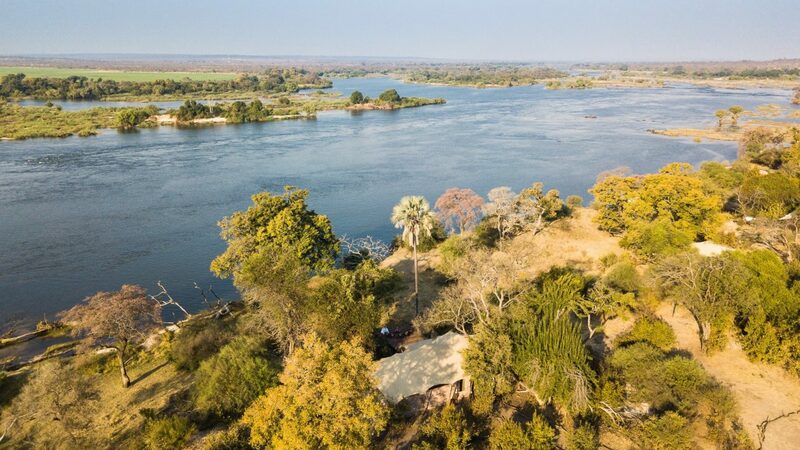 Sapi Explorers Camp, located along the Zambezi River, offers a base to explore some 1,000 square miles of prime wilderness now available exclusively to guests of Great Plains Conservation. 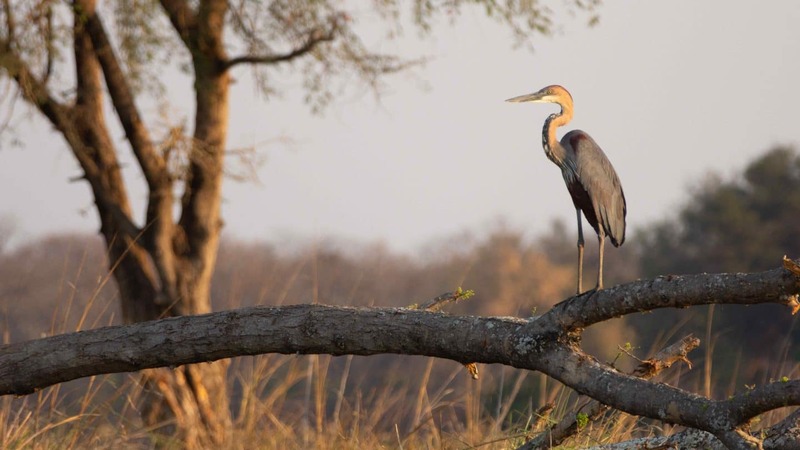 The area includes the Sapi Reserve, Mana Pools and the Zambezi River. A nearby sister camp, Sapi Springs Camp, is located inland along the seasonal Sapi River. Access to the Sapi Airstrip and Reserve is through light aircraft transfers from Harare International Airport (1 hour 20 mins) or Victoria Falls International Airport (2 hours and 20 minutes). Complimentary return road transfers from the Sapi Airstrip to camp are included in the nightly rate. 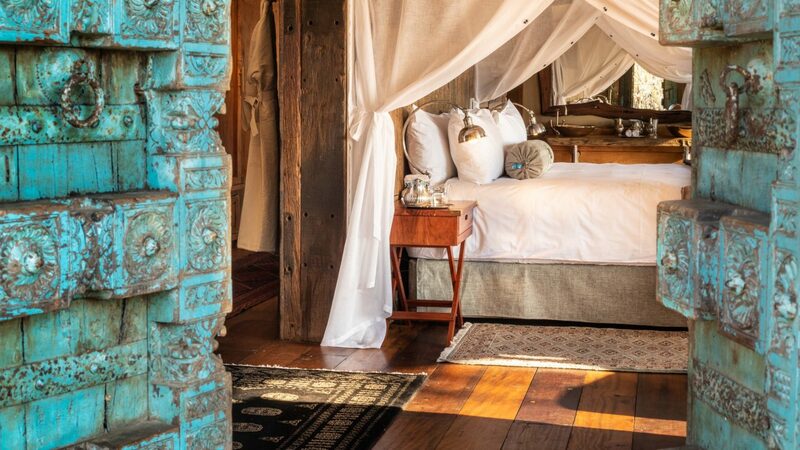 Mpala Jena and Mpala Jena Suite set in the Zambezi National Park, just north of the famed Victoria Falls, offers travelers to Zimbabwe an exquisite and exclusive tented camp experience on a private concession within the park on the banks of the great Zambezi River. A natural spring runs through the concession and attracts an abundance of wildlife throughout the year, especially in the drier months of April to October. The camp keeps its footprint light, relying on natural and sustainable resources where possible. The camp was named after the white impala, a rare “ghost-like” albino impala in this region living along the river. The area sees high concentrations of buffalo and elephant from June through to October and is also good for bird watching throughout the year. 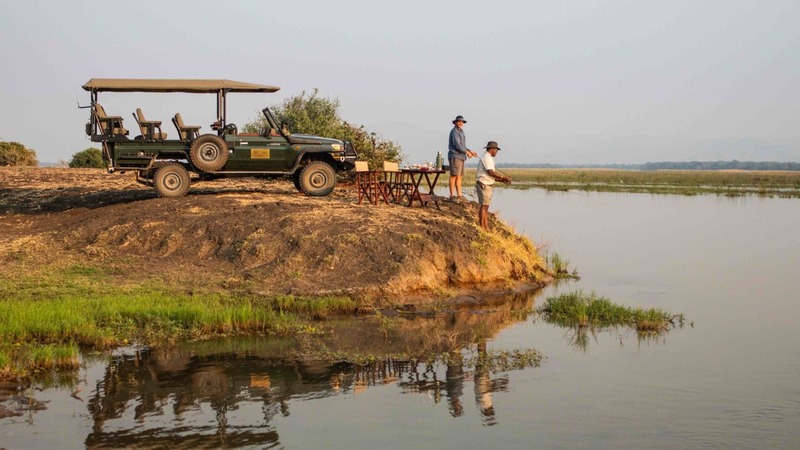 Great Plains’ Sapi Springs Camp and Sapi Explorers Camp both focus on the private Sapi Reserve on the eastern boundary of the Mana Pools National Park. The area is part of a UNESCO World Heritage Site and has been awarded to Great Plains Conservation to manage. 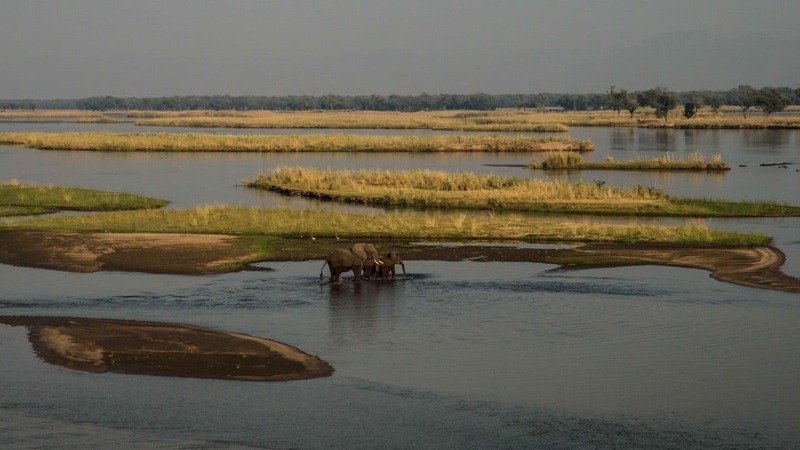 The huge swath includes the middle-Zambezi biosphere reserve with nearly 900,000 acres of prime wilderness – 85 percent of these acres traversable only by foot. For intrepid travelers who want to touch the ground, smell the earth, feel the wind, connect with the land, Zimbabwe is Africa’s dream walking safari destination. Mpala Jena and Mpala Jena Suite are are well suited for couples, honeymooners, small groups and families. Children, however, must be at least six years old and be supervised by a family member at all times. Children must be at least 12 years old to participate in walking safaris. 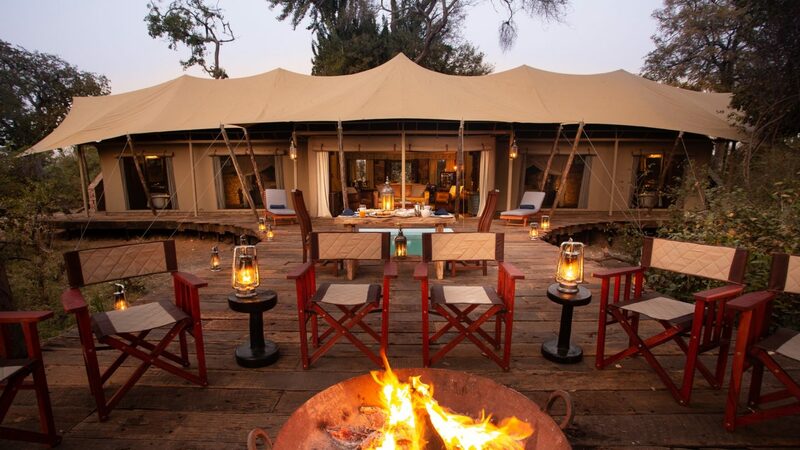 These camps are the perfect combination for travelers to Great Plains camps in Botswana including Zarafa, Selinda and Duba Plains, as well as for guests arriving from luxury safari camps in South Africa. As for Sapi Springs Camp and Sapi Explorers Camp, ideal clients are couples or small groups, particularly those looking to be active on safari, getting out on foot and by boat to explore the area. Children are welcome but they must be at least 12 years old and share the small accommodations with an adult. This is a true camp and there are no triple opportunities in the accommodations. Children must be supervised at all times. Similarly, guests with wheelchairs or walking challenges will not be accommodated due to the rough terrain. For honeymooners: the Mpala Jena Suite is ideal for its intimate setting. 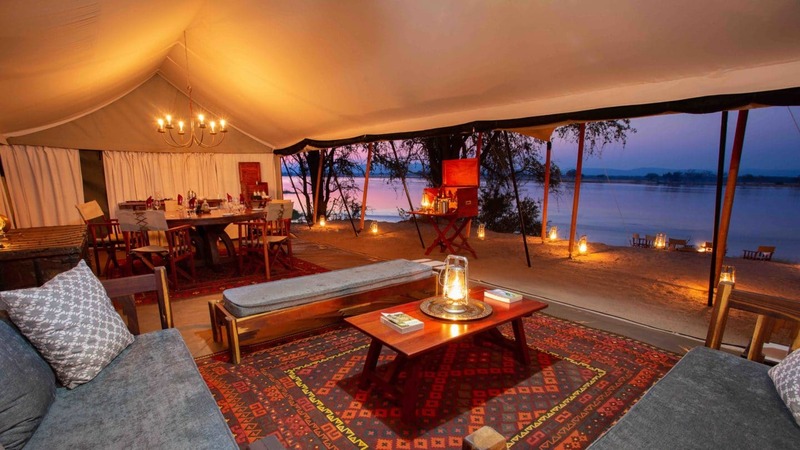 Accommodations are in a large canvas tent set off from the rest of the camp with two bedrooms and en-suite bathrooms, a living room and dining area, private plunge pool and private verandah. Mpala Jena offers four guest tents with canopy ceilings, recycled hardwood flooring and views of the river. Find Moroccan style influences throughout the decor. Each tent is conveniently fit with a small lounging area, a writing desk and en-suite bathroom facilities with double sinks and an inviting bathtub and indoor shower. Hot and cold water are supplied and there is electricity thanks to solar paneling, and fans that cool the air. Nets and ultrasound technology keep the bugs away. Yoga mats, weights and other fitness accessories are supplied and in-room massage is available. Decking in front of the tents lead to private plunge pools with views of the Zambezi River. Although the location does not receive cell signals, Wi-Fi is available in all the tents. The central commons facility brings a dining area, lounge and library, an open kitchen, souvenir shop and wine cellar. The Mpala Jena Suite takes advantage of all the common elements in the camp but brings welcomed added privacy. The accommodations are carved from a large beige canvas and set on raised recycled hardwood decking with bedrooms offering single and double bed configurations. The tent encompasses two private bedrooms with connecting bathrooms (each including an indoor and outdoor shower, bathtub, double basin and dressing table). The tent offers air conditioning as well as ceiling fans. The bedrooms open to central dining and lounging spaces and a large decked verandah and plunge pool. The tent can accommodate a party of five, if there are children along. 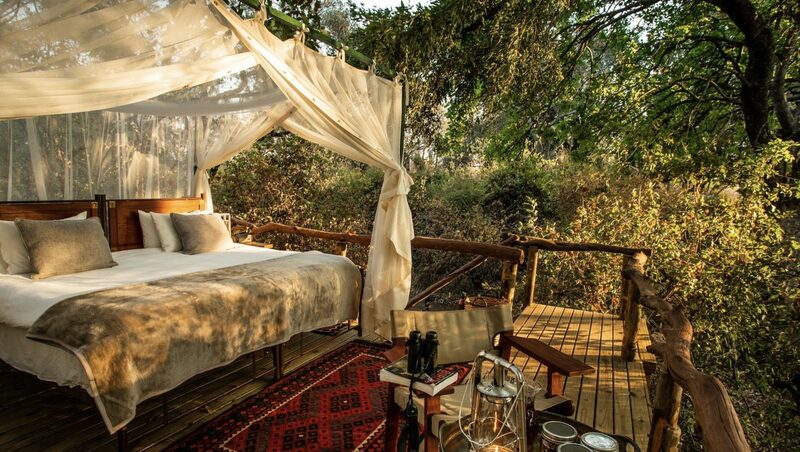 Sapi Springs Camp offers guests a chance to sleep under the starlight with three raised platform decks supporting comfortable beds that lie beneath flowing mosquito nets for an authentic and very intimate experience of Africa. In the event of rain, there is a sheltered bedroom area under each platform. Platforms also house ground-level dedicate bathrooms. A common dining location manages the meals. As can be expected, there is no room service or maid service, although laundry can be managed and returned within 24 hours (as long as it doesn’t rain). This camp does not offer electricity, except by portable solar power. Charging of devices can be done in the common area and through ports in the vehicles. There is no cell service or Wi-Fi at this camp. 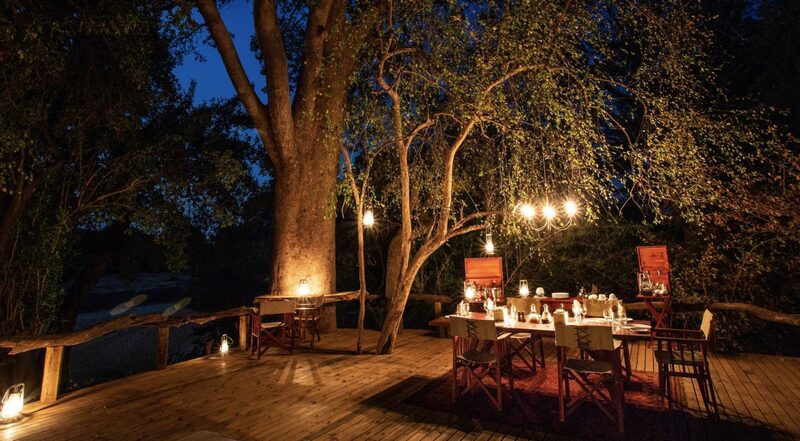 Sapi Explorers Camp sleeps ten in five tented accommodations overlooking the Zambezi River. Each tent offers single or double sleeping configurations and an outdoor seating area. The tents are wired for electricity and come with ceiling fans and electric lights, but do not offer charging capabilities. En-suite bathrooms come with a shower. The layout at the camp is not conducive to those with mobility challenges. The area is exposed to the wild, thus large animals and predators are known at times to walk through the camp, Guests are warned and asked to be mindful and careful. Staff is on watch as well. A central facility provides the meals, coffee and tea services, and charging stations. There is no reliable cell service or Wi-Fi here. All camps include day drives and guided walks. Night drives are offered at the Sabi camps. Canoeing is an option at Sabi Explorers Camp. All meals and alcoholic beverages (excluding branded spirits and Champagne) are also included. Clients should bring cash, and some of that cash should be changed into local currency for the purposes of leaving gratuities or managing any problems. Visitors should not depend on credit cards. Clients also should have their malaria and other vaccinations up to date and arrange their comprehensive insurance coverage to include emergency evacuation benefits. The tents are in wild lands and although trained staff is on hand for protection, anything can happen in Africa. Victoria Falls is worth the visit. On the Zimbabwe side, Victoria Falls Town is in walking distance to the falls. Visitors should expect to see wild warthogs wandering the streets along the way. If they plan to visit Livingstone Island on the Zambia side of the falls, it is recommended they purchase a “two-country visa” to avoid added paperwork and costs when returning to Zimbabwe. The cost at the border is $50. To see the Falls, visitors might want to go into the actual “Falls” park to view of this World Wonder that is twice the height of Niagara Falls (355 feet) and a mile long. Adventurous souls can bungee jump, swing or zip-line from the Victoria Falls Bridge for $160 per leap of faith. Or they can head to Devil’s Pool on the Zambian side of Victoria Falls to soak and swim at the base of the falls. Visitation there is limited to 100 people a day, at staggered entry times, and tickets ($165 per person, including lunch on the lunch tour) must be purchased in advance.